There are some vegetables that have undergone a complete metamorphosis in the last few years and the humble Brussels sprouts is certainly one of them! My childhood memory of them is that of bitter, grey-green odious orbs served up alongside mashed potatoes at Thanksgiving. I was never a great fan. But over the years of creating veggie dishes for special family dinners, I have discovered myriad, wondrous ways to cook these little beauties, and more recently I have discovered raw Brussels sprouts. I had always assumed that they had to be cooked before eating, but I am happy to report that thinly sliced or shredded, they make a wonderfully crunchy base for salads, much like cabbage does to cole slaw. Today’s salad is a gorgeous example of raw Brussels sprouts in a salad. 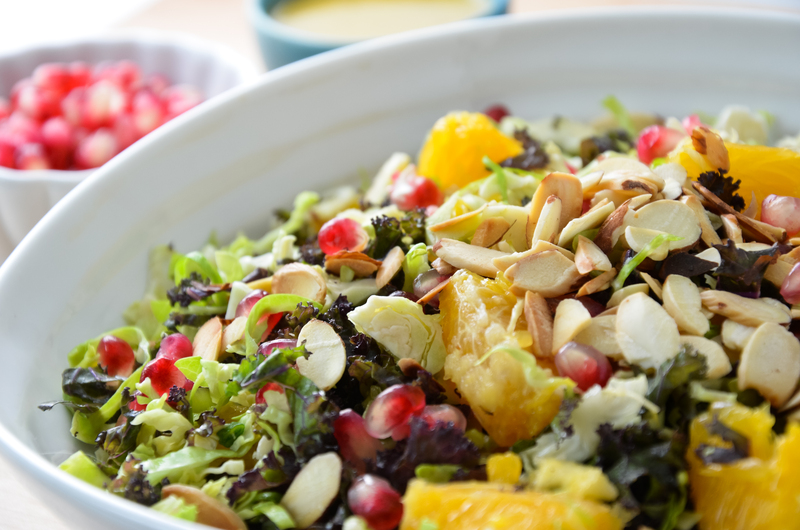 Added crunch comes from golden toasted almond slices and ruby pomegranate seeds. 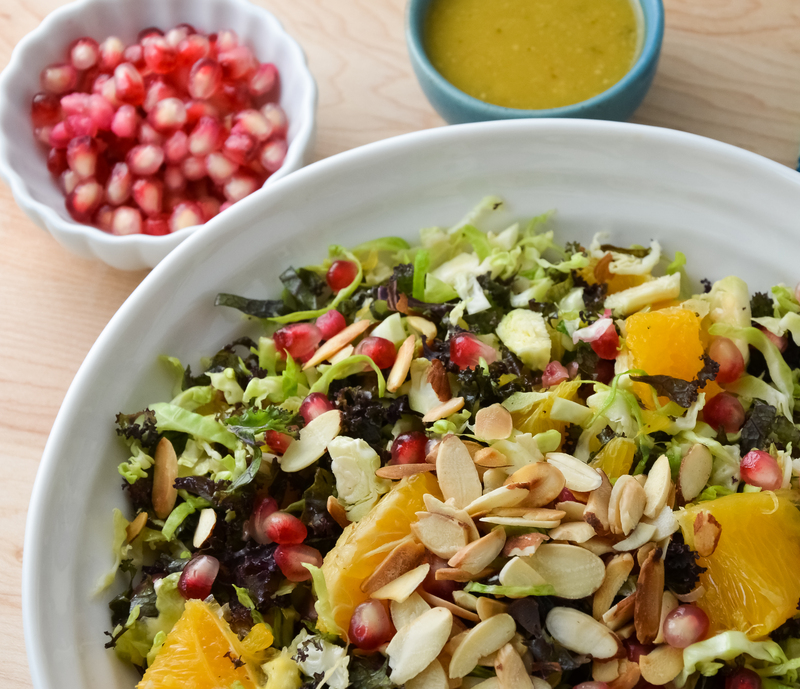 Orange slices add a splash of freshness and the almond butter in the dressing adds a rich layer, so that every bite is perfectly satisfying. I found the recipe in Taste Magazine’s Fall 2014 issue. I will bring a giant bowl of my salad over to Angie’s Fiesta Friday. Please come and join us, a bunch of passionate foodies who love to share their latest and greatest creations. Finely shred the Brussels sprouts and kale leaves. Place in a large bowl. 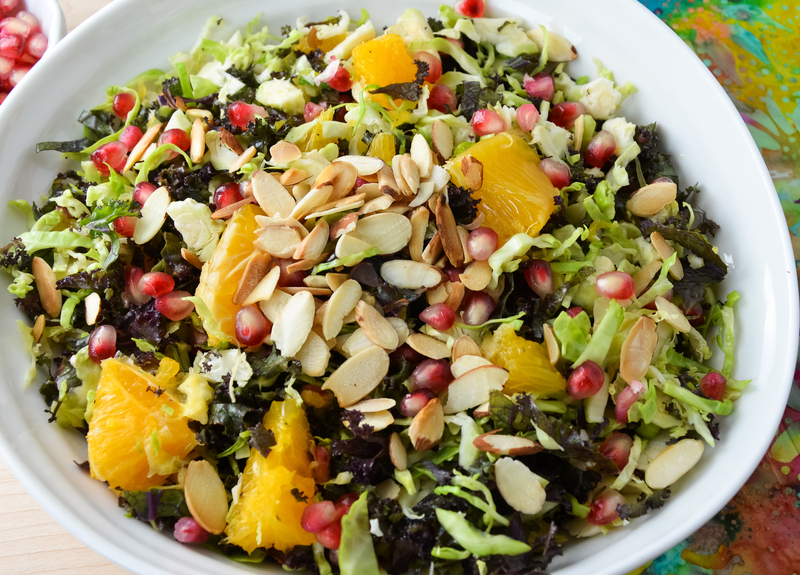 Add the oranges and pomegranate seeds and toss to incorporate. In a small bowl, whisk together the Dijon mustard, honey, orange and lemon juice, almond butter, olive oil, salt and pepper and chives. Add the dressing to the salad mixture and gently toss. Just before serving, add the almonds and toss to incorporate. Serve immediately or within 1 hour. Every bite has a satisfying crunch! I love that you guys have a bunch of foodies who get together and share. Wish I had that! Sounds great! I connected through Instagram as well (I’m Liz on instagram). I look forward to all the delicious food pics! This does look fantastic and the almond butter in the dressing is interesting! I’m going to steal that idea when I want to make some of my vinaigrettes creamier! Fabulous salad. Thanks for the idea – both the salad and the dressing. Wow, this salad looks so colorful and delicious! I agree about the Brussels sprouts! I never knew they could be so good! Yeahhh, for Brussels Sprouts! So healthy too! Scrumptious! Love everything in this colorful salad! oh wow Julianna this looks like a really healthy, colorful and crunchy salad! I never knew brussel sprouts could be eaten raw so will have to try this now! So glad that I can spread the good news about raw Brussels Sprouts! I hope you get a chance to try them, Indu! Yumm…sounds healthy and tasty too! Thanks Lina! Happy Fiesta Friday to you! Thanks Serena! I am really enjoying your Photo a Day series! Very inspiring! Thanks SKD! I think this is a great summer salad! Me too! They are now one of my favourite veggies! So many incredible flavours in this…and I love the sound of raw brussels sprouts (I always want to right brusselsprouts). I’ve never eaten them expressly raw, but I do like eating the leaves I peel off from the outside when I’m prepping them! Glad you like it Chitra! It looks very healthy and delicious salad. Oh my! This salad looks absolutely delicious, so colourful, fresh, fruity and tangy, pinned for later! The only things I’m craving lately are fruits and salads… so your recipe is perfect, everything is already there! Oh this looks absolutely wonderful. I am eating more veggies lately so this totally attracted my whole attention. I shall definitely give it a try. Have a wonderful week!